THIS PROPERTY IS 100 PCT NON SMOKING The Embassy Suites Napa Valley CA hotel is located in the heart of Napa and Sonoma Wine Country conveniently located near historic downtown Napa Napa Premium Outlets the Napa Valley Wine Train and hundreds of world-renown wineries such as the Robert Mondavi Winery. Enjoy newly remodeled guest suites featuring stylish furnishings and contemporary amenities. This full-service all-suite hotel is just minutes from the Eagle Vines and Chardonnay Golf Clubs the Silverado Wine Trail the Napa Valley Opera House the Uptown Theatre the Culinary Institute of America Six Flags Discovery Kingdom Infineon Raceway and the towns of Calistoga CA Rutherford CA Yountville CA St. Helena CA and Sonoma CA. One hour from the hotel is the city of San Francisco Oakland and Sacramento. Guests of Embassy Suites Napa Valley enjoy spacious newly redesigned guest suites with living room private bedroom and bath complimentary full cooked-to-order breakfast and a two-hour evening beverage reception. 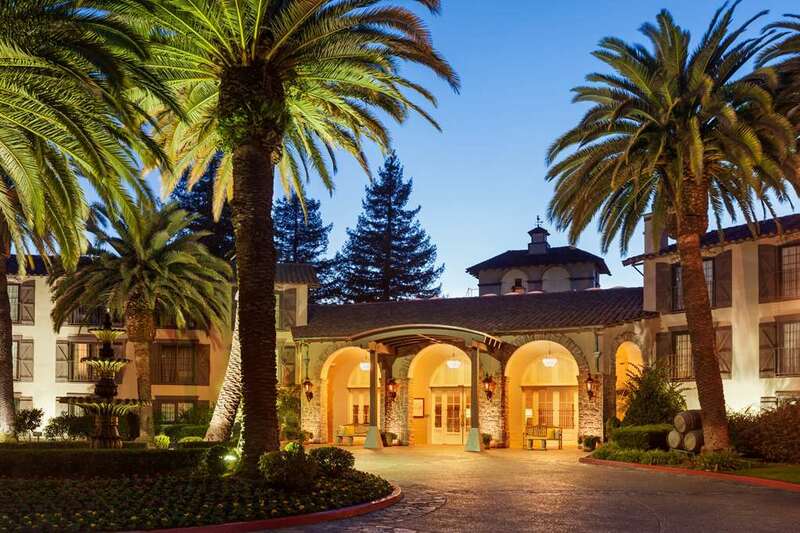 The Napa hotel is situated on seven acres of beautifully landscaped grounds featuring palm trees California redwoods rose gardens and our signature mill pond graced by resident swans. Indoor and outdoor swimming pools and a complimentary on-site fitness center are available as part of our amenity package. Grille 29 Restaurant - Lounge prepares gourmet delights daily and is a favorite among the locals. Flexible meeting and banquet space entranced by a Mediterranean-style fountain courtyard make the perfect setting for a special event wedding reception for business meeting for up to 200. In-Suite Dining: For our guests who would like to enjoy our classic menu in the comfort of your suite...our Grille 29 Restaurant is ready to serve you. Enjoy fresh homemade pizza burgers sandwiches soups salads and more.